A flan is a flan here in Barcelona and any other place on earth, so if this custard were an animal or something, this picture would be called, common caramel flan. There is nothing new to it. I could be telling you that "this old English word "flan" and the earlier forms "flaune" and "flawn" come from Old French flaon (modern French flan), in turn from early Medieval Latin fladōn-em, derived from Old High German flado, a sort of flat cake, probably from an Indo-European root for 'flat' or 'broad'" and I would be quoting wikipedia, as in fact I am doing right now. I could even give you a link to some nice flan recipes, like Spanish flan and I would dare to recommend you try to use condensed milk for that (my favorite choice) but, nah, that would be too boring a post much more related with Spanish cuisine than with Barcelona. But it happens that I shot this bluish picture in some Spanish restaurant in Barcelona and I enjoyed the display and the light and the perspective so here we are talking about nice looking custard for a change. Enjoy it! Nice display but then it's flan. 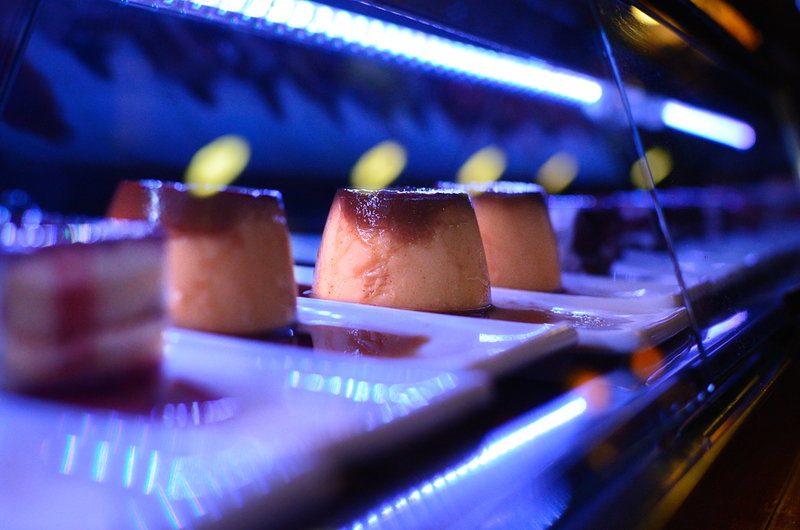 Flan looks Oh so delish in any light!